A couple of friends and I hosted a double baby shower recently. For the shower, we placed a few simple ideas around the house to keep guests busy and talking.... I guess you could call them shower games... we chose these games because they ended with something tangible the moms could take home, use for the baby and most importantly serve as a reminder of all the love and support from friends and family. To go along with the ideas, I created several printables with helpful info and instructions. Of course they were also used to add a little color to the party. These baby shower printables are available for you to print and/or download. All free! These cards were set in front of each bowl/plate on the yogurt bar and labeled with the food name. They were also set in front of the games with directions printed on the card. If you don't have a program to add text to the label before printing, you could write on the label with a fancy marker or use lettered stamps to add info. The baby wish cards (or prayer cards) were stacked together and set beside a jar for guests to write their prayers for the baby. Each card had one of the following: I pray you learn, love, laugh, become or respect _____________. Once the guest filled in the blank, they dropped the card in the jar for the mom to take home. Two glass jars were filled to the top with baby supplies.... one with cotton balls, the other with q-tips. We framed a sign enticing guests to play this guessing game where they filled in their guess of how many cotton balls and q-tips were in each jar. The guests closest to the correct numbers won a prize. We had a tree with bare branches and a Bible verse printed on cardstock paper..... guests pressed their finger on a colored ink pad, then placed their ink-filled-finger on the paper to resemble an image of a leaf. We later framed the tree for the mom to take home. Lastly, we had hoped to play this game, unfortunately I didn't have enough baby pictures in time.... so I'm passing this one on to you! The game is simple. Hang baby pictures of everyone at the shower (clipped to a string, taped to posterboard, laid on a table, etc) and label them each with a different number. Place a sheet of paper listing all the names of the babies in the photos (in random order) for all to see. Then hand out the trimmed sheets below and let guests have fun guessing the names of each baby. The printables above are all available for your personal use, for FREE! So, go ahead and download, print or just pass along the link. The instructions are simple.... print on 8.5x11" paper. For the labels, baby wishes and numbered guesses, cut along the lines to trim. For the guessing game sign and tree art, trim to fit an 8x10" frame. And for the name that baby game, cut in half both horizontally and vertically. These baby items are super. Thanks for these games and printable option for printing these baby shower games. What is the curly font used? The 'baby' part in Name that baby? These are so beautiful! Thank you for sharing! I'm using all of these at my SIL shower in Houston over Memorial Day weekend. Thanks again! You saved me a bundle and this is SO GORGEOUS! 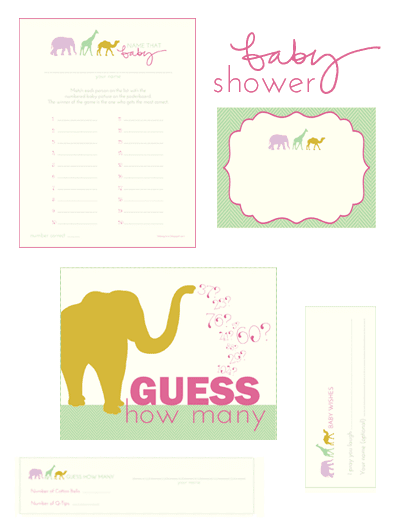 Awww thanks for sharing these free printable baby shower games. I'm sure all of them are fun to play!~ Thanks! Baby Shower Gamesfor free !